If your dream is to operate a successful restaurant in New Mexico, you’ll first need to learn how to create a realistic budget. Far too many restaurateurs have had to find out the hard way that their money is stretched way too thin. At that point, shutting down can seem inevitable. The only defense against this nightmare scenario is a budget that will keep your spending to a responsible level. Every business needs a budget, but they’re especially important for restaurants because money is constantly moving in and out. There’s no realistic way to track how much you can afford to spend unless you have a budget. Sales – This is the total of everything you sell, from food to spirits to merchandise and more. Prime Cost – This is how much you have to spend to make those sales, including payroll, the cost of the ingredients in your food, and the total for your drinks. Controllable Income – This amount represents any costs you have some control over, like marketing and repairs. Net Income – Add up your prime cost and controllable income and subtract that from your sales. The total is your net income, which is how much you made (or lost) for that month. 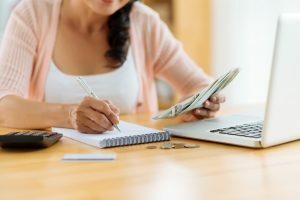 The first time you create your budget, you’ll have to estimate your sales and do your research to see how much your costs will be. By the next month, though, you’ll have hard numbers with which to work. However, you shouldn’t open your doors until you have sufficient capital to cover your expenses. While a budget is absolutely essential to your success, if it’s your only frame of reference for how well your restaurant is doing, it won’t be doing well for long. This is where your cash flow statement comes in. It literally shows you how much cash is coming and going on a regular basis. Among other things, you need an accurate cash flow statement to inform your budget. After all, if money isn’t coming in like it used to, your budget needs to be adjusted or that problem will only persist. To create a cash flow statement, track all the sources of money that are coming into your restaurant. That money is part of your inflow. Any credit-based income doesn’t count until it is actually paid. Then, find all the things you’re spending money on. That’s your outflow. Don’t count any of your restaurant’s debts until they’re paid. Once again, subtract your outflow from your inflow. Now you have a definite sense of how much money is either coming or going at any one time. Use this data to revise your budget as necessary. Of course, a lot more goes into making your restaurant a success than just a reliable budget. Don’t worry, though. At the New Mexico Restaurant Association, we make a wealth of resources and support available to our members. Whether you already own a restaurant or are looking to launch one in the near future, join NMRA today to bolster your chances of success.